ccdB Survival T1 phage resistant cells. standard conditions. Invitrogen Gateway 3-fragment compatible destination vector. 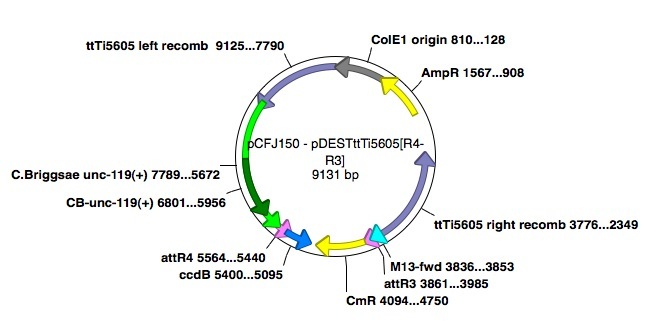 Contains C.Briggsae unc-119 rescue fragment. 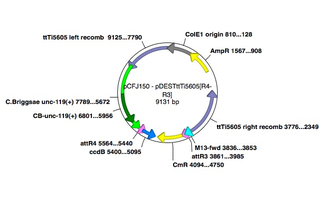 Also contains genomic regions flanking ttTi5605 Mos1 insertion to generate MosSCI inserts at this locus. Please note that due to a bug in the Addgene map algorithm, the attR sites are depicted as attR1 and attR2, when in fact they are attR3 and attR4. Please refer to the author's map for an accurate depiction of these sites.